Sent in by our friends at the Benedictine Sisters of Perpetual Adoration in Clyde, Missouri. Congratulations Sisters! CLYDE, Mo. - Three Benedictine Sisters of Perpetual Adoration recently observed their jubilees of monastic profession, surrounded by Sisters and guests. The celebration took place at Our Lady of Rickenbach, the Congregation’s healthcare facility, and included a special mass and dinner. Combined, the Sisters have experienced 210 years of monastic life. As the oldest member of the Benedictine Sisters, Sister Mary Irmina holds a wealth of memories and knowledge about contemplative life. “I am grateful that God called me to our Congregation and for the daily Eucharist,” she recalled. With 10 siblings, she was the first to enter religious life. “I read a missal that it was vital to save your soul. So from my early days I had a desire to become a sister.” She entered when she was 19 and took her first monastic profession on March 16, 1929. 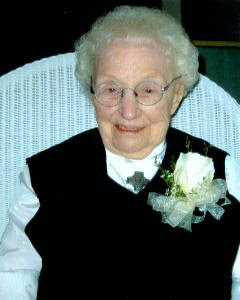 For decades, she served the Clyde community in the kitchens, the bakery and on the farm, raising chickens and milking cows. She also lived in other communities, helping with altar bread production and in the sacristy. It was while at the St. Louis monastery she developed her craft of baptismal stoles and other items. She also recently celebrated her 102nd birthday. Born Angeline Kramek in Hamtramck, Mich., and raised in nearby Detroit, Sister Mary Pauline learned of the Benedictine Sisters through their magazine. 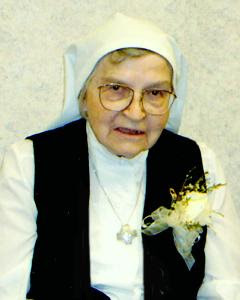 Drawn to prayer before the Blessed Sacrament and feeling a call to religious life, she entered the Benedictine Sisters in 1937 at the tender age of 16. She made her first monastic profession on Aug. 26, 1939. Throughout her years as a Benedictine Sister, she has lived in many of the Congregation’s communities, including Clyde, Mo., Mundelein, Ill., Kansas City, Mo., San Diego, Calif., and Tucson, Ariz. Her jobs have varied to include portress, sacristan and liturgical vestments making. Catherine Mary Gross was 27 years old and contemplating a call to religious life. The business school graduate, who enjoyed her work with companies like Southern Pacific Railroad and state and federal government agencies, had never heard of the Benedictine Sisters of Perpetual Adoration. When she briefly spoke with a priest he remarked she should inquire about the contemplative order. It made sense as she had her doubts about joining an order devoted to teaching or nursing but had no intention of leaving her beloved native California. However, in the following months she discovered she was a perfect fit for the religious order dedicated to Eucharistic adoration and a life of prayer. 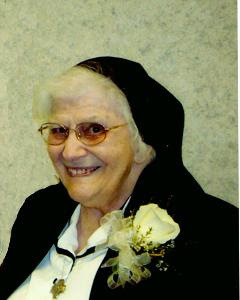 She entered in 1947 and made her first monastic profession on May 29, 1949, receiving the name Gertrude.